THE 47% CONTROVERSY. About Half of Americans aren’t paying federal income taxes. Can that be that right? First of all let me clarify that we are only talking about “Income” tax. But it is true! A provocative statistic. Last July, the nonpartisan Tax Policy Center (a joint venture of the Urban Institute and the Brookings Institution) estimated that 47% of Americans would not owe a penny to the IRS for tax year 2009. The White House has projected the federal deficit at $1.6 trillion for 2010 – that’s about 10.6% of our GDP, a percentage unseen since the 1940s. Is it fair to the nation that so many Americans are legally avoiding federal income taxes? How does this happen? A major reason? Refundable tax credits. The Making Work Pay credit and other tax cuts accompanying the federal stimulus gave millions more of us a refund this time around. If these credits hadn’t appeared, the TPC says 38% of us still wouldn’t have owed federal income tax for 2009, thanks to assorted variables – astute tax planning, low taxable income, and other factors. People who assume the rich are dodging taxes are misinformed. The TPC found that only about 1.5% of those with taxable incomes of $1 million or more owed no federal income tax for 2009. For those with taxable incomes from $500,000-$1,000,000, the estimate rises to just 2%. If you made between $75,000-100,000 in taxable income in 2009, you may have been in the lucky 9.2% who the TPC says didn’t owe anything to the IRS. In contrast, it figured that 61.8% of taxpayers who earned $20,000-30,000 last year and 47.5% of those with taxable incomes from $30,000-40,000 had no federal tax liability. Can you bring the deficit down without new or excessive taxes? Cut war spending by $250 billion. Save another $252 billion by letting tax cuts sunset for couples making more than $250,000 yearly. Collect $331 billion in bank fees. Save $105 billion from a selective federal spending freeze. This could shrink the deficit to around 3% of GDP, which the Treasury feels is bearable. That all sounds good except it doesn’t take into consideration that all of the new spending packages, including health care “reform“, “stimulus” pay offs, and “jobs” bills far exceed the saving provided above, even if they all came true. A federal spending freeze might have worked about $2.5 trillion ago. 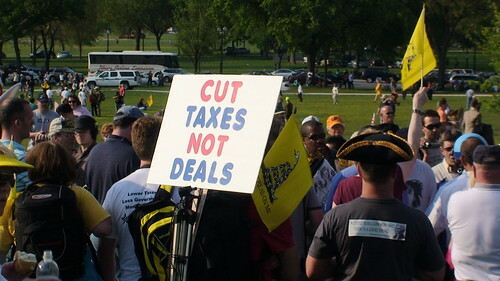 The only way out now is to cut, not freeze, spending and also raise taxes which is what we are about to see. Higher federal income taxes and many new kinds of taxes seem to be looming in the future. As for legislators figuring out a way to spare us from them, that would seem a long shot. Hopefully, bipartisan politics will get in the way. Watch out for the VAT tax. It could be the single most inflationary type of tax I can think of! The good news is 100% of the people will help pay for it! The bad news is 100% of the people will pay for it by paying more for 100% of the products they buy! Check out more info on the Value Added Tax.